“We played with a 4-4-2 but were being outnumbered in the middle so we changed back to 4-2-3-1 to pack the midfield”. This formation relies heavily on wing play. The wingers and overlapping full backs make it a point to put crosses in the box for the forwards to attack them. 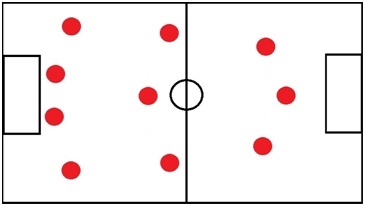 The central midfield pairing usually involves a defensive midfielder and a box-to-box midfielder, to break up play and spread the passes to team mates, respectively. On the defensive side, it is important for the wingers to cover for their supporting fullbacks because the system is prone to counter attacks. A little tweaking in 4-4-2 can change it to a 4-4-1-1 where one of the two forwards takes up the role of a support striker and sits a little deeper than the other to link up play between midfield and attack. The safety first formation. The formation basically involves packing the midfield with 3 central midfielders and 2 wingers. The idea is to keep possession in the middle of the park and nullify any threat from the opposing full backs or wingers. While attacking, the lone forward holds up the ball until support arrives from the midfield. Defensively, it is a strong formation because there are banks of 5 and 4 players for the opposition team to pass through. 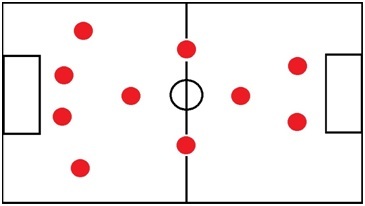 This formation is widely used by managers when playing away in European competitions, because of the Away goals rule. 4-3-3 is an attack minded formation that is the rage these days. 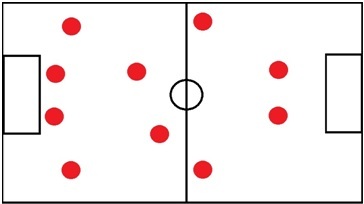 The midfield usually consists of one defensive midfielder with two box-to-box midfielders. The forward line consists of three attacking players- left, right and centre. 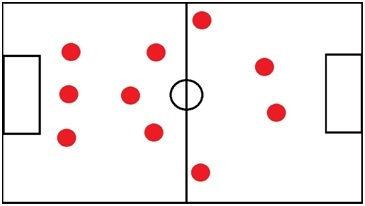 The left and right attackers can be traditional or inverted wingers so there are multiple options in attack. The success of a 4-3-3 depends on quick passing between the front three and midfield and an urge to keep possession in the tightest of situations. Due to the emphasis on attack, the defence is prone to counter attacks or balls played over the top. 4-3-3 is guaranteed to bring goals but can be carried out by very few teams because of the quality of players required to play it. 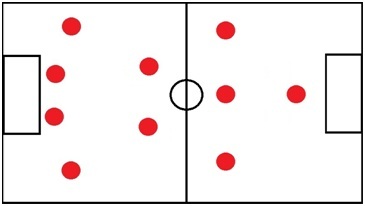 A rather modern formation which is capable of morphing into many others while in play. The system basically involves using 2 midfield anchormen who break up play and support the other 4 attack-minded players. The central attacking midfielder acts as the link between the midfield and forward line. If the right players are involved, this can be one of the most dynamic of formations capable of turning into a 4-5-1 while defending to a 4-3-3 while attacking. The central attacking midfielder is the most important link in this formation who can be capable of dictating play because of his position. However the whole attacking threat can be nullified by tightly marking the CAM. The most radical formation of all. 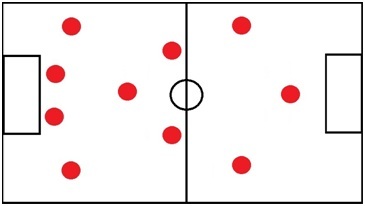 The system involves playing 3 central defenders who act as sweepers. The 2 wide men in midfield are required to track back while defending to act as wing-backs. Counter attacks can be carried out very lethally with this formation because there are always a number of options to pass the ball upfront. Also known as the Diamond. The midfield is arranged in the form of the diamond where the central attacking midfielder plays at the tip of the diamond and the base is occupied by a defensive midfielder or a deep lying playmaker. The remaining two midfielders can either act like wingers or central midfielders depending upon the situation. If employed effectively, this formation can act as a lot of trouble for the opposition because of the movement and interchange that can happen in between the diamond. The formation suffers from a lack of width and is easy to attack against if there are speedy wingers and full backs in your team.